When I think of the Aryans of the ancient times, I think of Central Asia, the steppe, a horse culture that could enable their language, Sanskrit to spread, at a gallop, so to speak, westward and south, to form the basis of virtually every European and many subcontinental languages in the millennium before Christ. The domestication of the horse on the steppe was perhaps the principle driving force behind Sanskrit’s spread to the west. Today, both Europe and much of Asia have retained an equestrian culture and indeed, when the Spanish arrived in the Americas they brought with them the horses that would eventually form the backbone of the cultures of both the invaders and the invaded. However, that horse culture never arrived in the subcontinent, in spite of the fact that Sanskrit had, and the people whose language it was are most associated with it, specifically India, in the modern sense of the name’s usage. Had the Aryan warriors of the plains of Asia, crossed the mountains of the Hindu Kush and successfully invaded the plains of what would one day become Punjab on horseback, then would not that animal, that beast that they had at one time held so dear that they be buried with it, remain an integral part of Indian culture today? The language remains. The Vedic gods remain. The Vedic texts remain. But where are the horses? Would successful invaders abandon such an advantage? Upon arrival in the subcontinent, the Aryan clans appear to have adopted the cow as an animal around which their society would be built. Not the horse. The cow became divine and the workhorses became buffaloes, or elephants (also considered to be divine). Were these the creatures that were venerated by the indigenous peoples whose land had been overrun? Was it the spiritual culture of the vanquished that was to conquer the souls of the victors? At the time that the Aryans are thought to have been migrating south and west, other sophisticated cultures, eclipsing that of the Aryans themselves, existed in other parts of the world. In the Americas, the Mayan people had mapped the firmament, developed a sophisticated calendar and built extraordinary pyramids, it seems without the use of the wheel. Their temple complexes, we are taught, like those of the Incas of the Andean ranges, were built using primitive technologies-at best, and yet the gigantic blocks were placed so precisely, that even after hundreds, sometimes thousands of years of weathering, a cigarette paper could not find a home between them. In North Africa, the Egyptians enjoyed a culture that was thriving, perhaps even declining at the time the Aryans arrived in the northwest frontier of ancient India. They too had developed a civilization that was sophisticated enough to have also accurately mapped their celestial environment and kept good time with their calendar. Few in the world have not heard of the pyramids of Giza or are not able to recognize an image of the Sphinx. The pyramids of Giza and those at the other sites that run north to south along the Nile valley; Abusir, Saqqara, Dashur, Abu Rawash, Lisht and Meidum , the first true pyramids, were also extraordinary works of engineering; precision cut stones without the tell-tale signs left behind by the chatter of the craftsman’s chisels. The keepers of the ancient traditions of Egypt’s indigenous culture insist that the stone blocks from which monuments and their accompaniments were built, were cut from the rock using sound, therefore cutting as precisely as we may achieve today with a laser. Sound and light technology was available to and understood by the ancient civilizations. Contemporaneously with the culture of the Nile, were those of the Euphrates; Sumer and Babylon, circa 4500 BC-1900 BC and 2300 BC-1000 AD respectively. Beyond the similarities in architecture and astronomy, are more subtle likenesses; the high esteem in which the cow was held, a rice-based culture, a priestly caste distinct and more highly regarded than those born into the ruling class and all existing in a climate and terrain very different to the North African and Arabian deserts that we know them to be today. In none of the civilizations mentioned above does the horse play a significant role at all. Of the hundreds of deities of Sumer and Babylon, the horse goddess, Silili, is mentioned only once in the Epic of Gilgamesh, recorded on the sixth tablet (line 57), of the seven on which it was originally written, in Sumerian cuneiform, some 2000 BC. Neither does the horse appear in the spiritual consciousness of the early Egyptians, indeed the horse was not introduced there until 1600 BC when the Greek speaking Hyksos people invaded them. 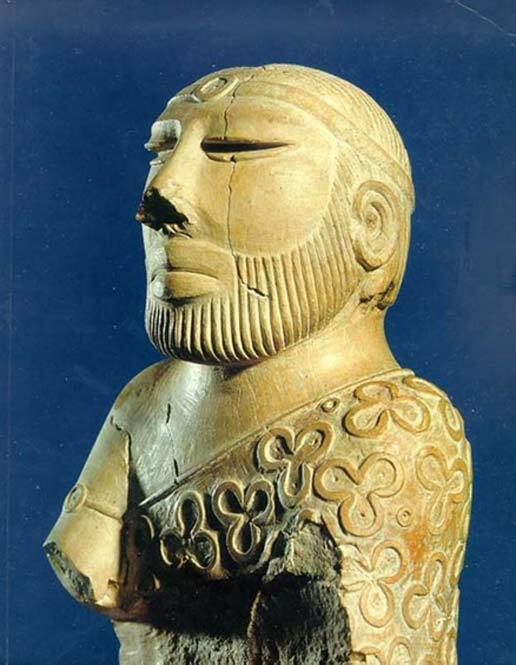 The Harappan civilization, of the Indus Valley , perhaps the most ancient of all of those that are known to us, that flourished sometime between 4000 BC and 1500 BC, shows no signs of horses until about 2100 BC, to which point in time, an equine skeleton found in an excavation, Surkotada, at Rapar Taluka, in the Kutch district of Gujarat, has been dated. The site had been discovered by Dr JP Joshi in 1964 and further work with his colleague, Dr Sharma, has unearthed more skeletons that date from between 2100 BC and1700 BC. These dates fall within the time frame that it is widely accepted by scholars as being the era during which the Aryan migrations began, bringing with them an established culture on the backs of their horses. Needless to say, other artifacts were reacquainted with the stare of the human eye, that shed evermore light on who the Harappan’s were, who they traded with, were influenced by, who they themselves influenced and perhaps, where they had come from, including copper seals almost identical to those found on Egyptian tablets. How had their civilization emerged from next to nothing until reaching its zenith, around 3000 BC, by which point the population had constructed the most technically sophisticated city in the world at Mohenjodaro? As the simplified translation infers, the mantra begins with syllable / sound (Om) and ends with the word that the Sumerians used to describe light, illumination, radiance - ‘ sootiya’. The Tamils of south India, whose ongoing culture and language were contemporaneous with those that have been mentioned until now, also used the word ‘sootiya’ to mean light, illumination and radiance. Thus it begins with sound and ends in light. This connection between the Tamil language, the oldest of the Dravidian (non-Aryan) languages of the sub-continent and the known cuneiform and hieroglyphic languages of the ancient world, is perhaps the most revealing of a common culture that has been lost to the inevitable changes of time. The idea that the Egyptian, Sumerian and Babylonian civilizations were connected is not a new one. For centuries Europeans have speculated and hypothesized that this was the logical development, through time, in that small part of the world. Some too, that the Indian had given rise to the Egyptian. The Egyptians themselves believed that they had, or their culture had, originated in the land that was known by them as Pant, and believed by scholars of the subject, to mean the western facing Malabar coast of the southern Indian peninsula. This aligns with their description of their ancestral homeland in every detail of flora, fauna, geography and climate. If people from the south of India had colonized Africa, presumably arriving at what we call, ‘the horn’ of that magnificent landmass, then those people would have been Dravidian people, keepers of the knowledge of their ancient ancestors, one of whom today, has flowing through his veins, the oldest, non-African DNA yet to be discovered. At the time that Britain was being re-populated by migrants from the European continent to which it was still attached, pastoral peoples grazed their cattle across the temperate savannah lands that occupied the vast area that we now know as the Sahara and into the Levant, Mesopotamia and peninsular Arabia, (that was less of a peninsula at that time, like people, continental plates move!). They depicted their lives in the art with which they decorated the places in which they stayed. Three dimensional figures that were not drawn by Europeans until into the middle ages. Early Byzantine depictions of Christ are in two dimensions, lacking both the depth and the sophistication of those who had etched and sketched in the millennia that had gone before - artists who had so graphically captured every muscle and sinew, hair and tissue of the creatures that they shared their space with, that today, after the passing of thousands of years and being blasted by billions of grains of sand, they are still often as vivid as a photograph. Buried deep under generations of naturally accumulated sand, were recently uncovered in the Egyptian desert, altars, each of them made to their own fashion. Three of them. Each used until abandoned to the ever advancing and deepening desert, and replaced by the next and another, until ultimately being drowned and lost beneath the waves of sand to await rediscovery. The most recently placed stone altar is known as the ‘cow stone’ for it’s clear resemblance to the same animal and had been put there deliberately, before the first ruler appears on the Egyptian list of kings, before the dawn of that civilization. It is also clear from modern aerial photographs and computer mapping, that the Nile was 200 miles to the west of its present-day channel, as it flows into Egypt from the Sudan, far into where the modern-day sand dunes have colonized and settled. The cow had found her place among the deities of the later Egyptians too, the goddess Plater was depicted as a cow, as was Hathor; one of the most ancient of deities; considered to be the mother, of the sun and the moon, the east and the west; a goddess of fertility and joyfulness, she was depicted with a horned cow’s head. From the earliest inscriptions of the old kingdom, circa 3000 BC, until a temple was begun to be constructed in her honor from 237 BC (during the Ptolemaic dynasty), Hathor was held in the hearts of the people with great affection, as many female, ‘mothering’ goddesses are, wherever in the world they are worshipped. She pre-dated the gods that we are more familiar with, Isis (who she’d later be associated with), Osiris and Ra, indeed she gave birth to them as it was she who was the primordial force that brought our world into being, much as Indra, among the Vedic gods was before being displaced by Vishnu, Shiva and their families in the Hindu pantheon. Hathor, ancient Egyptian goddess. Hathor is depicted in many forms, most commonly as a woman with cow-horns and sun disk. ( CC BY-SA 4.0 )/ Hathor in the form of a divine cow. Around the neck is a hathor-emblem and a sun disk rests between the horns. ( CC BY-SA 4.0 ). In her incarnation as Heset she appears as a white cow and is associated with the divine cow of the primordial age, Mehe-Heret who brought forth the rains that gave rise to the river Nile and whose name translates as ‘great flood’. 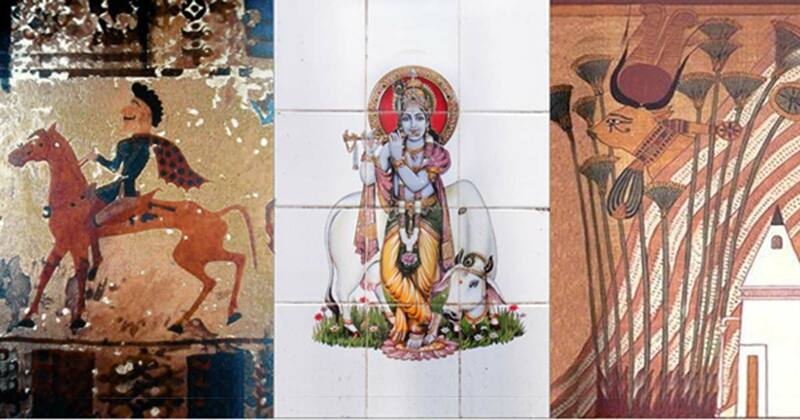 The cow was also associated with light, both in Egypt and India. In the former civilization, the association was with light from the sky, and in the latter, the early Hindu storytellers identified the sun god, Indra, as a cow and the word cow itself could also be used to mean, a ‘ray of illumination’, or light. In Sumer and Babylon, she was identified with Ninsumun, the mother of the hero of Gilgamesh, and whose name means, ‘wild cow’, in Sumerian. In the seventh century AD, Saint Isidore of Seville, wrote in his encyclopaedia of knowledge, Etymologiae (IX,2.128) of Ethiopians, that ‘they came in ancient times from the River Indus, established themselves in Egypt between the Nile and the sea’. From the Horn of Africa they spread up the Nile valley. Modern researchers of linguistics understand that the languages of this part of Africa and all those that are spoken to the north and west, are Afro-Asiatic, not indigenous to the continent. Furthermore, research into the genetics of North Africans reveals that what Saint Isidore had written about 1400 years ago, based on the wisdom of long forgotten ancient chroniclers, is not so far from the mark. There is evidence that suggests that people of Dravidian stock arrived in east Africa, bringing their language and culture, each of which over time has metamorphosed, giving the ancient civilizations that we have come to know their culture. It was from the Afro-Asiatic language group that the Semitic languages evolved, the spoken and written languages of today’s North Africa and the Middle East, Arabic and Hebrew among others. By the time that the Aryans had arrived on horseback in India, many of the ancient world’s civilizations and the languages spoken there, had been extinguished, their knowledge lost, remaining only to be debated by interested minds. The Sanskrit that they spoke, from then on became the language that would express the ideas of the Hindu cultural outlook. However, had that world view not eons before been created, refined, exported and developed across the seas to far-off lands? From Indonesia to India and to the isthmus at Panama, the culture is coherent and continuous in so many facets of the higher thinking necessary in advanced civilizations, that perhaps the horse was needed only to have to pull the carts, that carried the nails for the coffin of any theory advancing the notion of an Aryan supremacy. Euro-centric ‘origin of civilization’ theorists have often put the cart before the horse, perhaps it is time to re-evaluate whether or not the horse needs to be in the metaphor at all? About horses.Horses were used in the battle of Kurukshetra that took place about 5000 years ago.Also Vedas speak of ritual called ashvamedha yajna during witch horse is used.This ritual kings performed way before the battle of Kurukshetra. Egyptians.Vedas speak of event when "Many kṣatriya kings fled from India to other parts of the world at that time, and according to the authority of the Mahābhārata, the kings of Egypt originally migrated from India because of Paraśurāma's program of chastisement. " And Indra is the king of heaven.How come Indra being replaced by Vishnu?Vishnu is the creator of the material universe.This is clearly steated in the Shrímad Bhagavatam.